After only one night in Teheran we were on our way to Kerman, a major city in the south of Iran. The snow-clad mountains surrounding Kerman were just outside the windows of the plane when we went in for landing, a wonderful sight, the town itself nowhere to be seen, situated on a mountain-plain about 1700 meters above sea level. The old Hadji, our host in Kerman, sat next to me. I asked him about the altitude of this fantastic mountain, whereupon he responded that none could measure this mountain, because it was too tall ! He suggested that I should stick to measuring carpets, which was much easier. He should be proven wrong on this point, as the continuation of this story will tell. The first carpet-bazaar we entered was a great disappointment. A sterile room once painted blue, in a colour strongly reminding me of kitchens from the 50-ties, but now with strong patina. There were some stacks of carpets scattered around, containing very few carpets, but still as untidy as it possibly could get. Judging from the thick layers of dust covering these, one was led to believe that no-one had touched them in 20 years, and making it impossible to have even the slightest opinion about colours and design. The group of men, heavy smoking and arguing in the back of the room, gave us no sign of interest at all. So we strolled around, touching one carpet here, kicking another there, and were not sure what to do. Some of the carpets had a nomadic background, some came straight out of village-huts, where they had been “broomed” once in a while, none of them had ever even seen a vacuum-cleaner. Finally we managed to catch the attention of the owner of the carpets, and six or seven carpets were noted into the “Dafda Bozorg”. 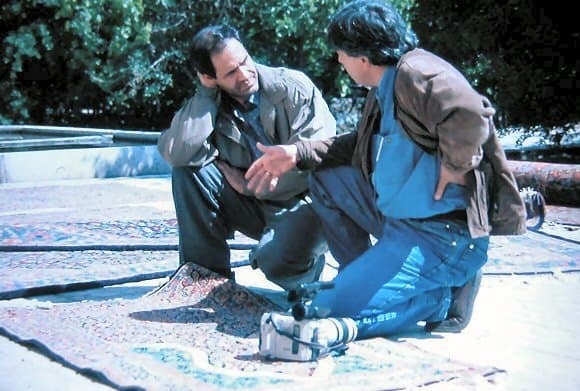 One of the carpets was an old Afshar from the vicinity of Sirjan, quite coarse, but with good wool and an interesting “Khesti”- or tile-design, in diagonal pattern, the ground colour of every square having alternating colours. The others were of a simpler quality than this one. The next place was next door. The entire room was covered with large Kerman-carpets, and on top of this large stack, the last arrival, another Kerman, had just arrived from the loom, not even being cut, with a pile almost one inch thick, and the design only visible from the back. Only one old Afshar-carpet with Goldoni-design and an old Khurdjin was our catch here. Afterwards he took us to a room upstairs, which did not contain anything interesting. When returning downstairs a visitor had arrived, mentioning that he had a collection of carpets to show us home in his own yard. I was not certain that this conduct was of the proper kind, stealing customers inside another man’s shop ! Later, we learned that this man, whose name is Kerimi, has sold a collection of carpets to the old man earlier the same day. In the nameless, unlit streets, all of them with sand-coloured mud walls with straws sticking out, making them look all identical, we managed to hang on to Kerimi’s car. The street scene could be from a never ending labyrinth in a horror movie. This was Kerman in the south of Iran. Under the overhanging roof of Kerimi’s yard we were gazing at some stacks of Afshar carpets. At once we started to throw the carpets off the stacks, one by one, anxious to see what he had to offer us. From the first stack we selected five or six, from the second, more, maybe eight or nine. About 70 % of the carpets made in the Kerman-Province in the local floral style are not made with real knots. The pile of these carpets consist only of a single tread which is bent over the warps in a V-shape. The pile of these carpets is only kept in place due to the fact that the “knots” are squeezed between the firmly beaten wefts and the warps lying in two planes. In an area between Kerman and towards the cities of Ravar and Rafsanjan, carpets are knotted with real knots locally known as “Nimbaff” ( i.e. : half knot) or “Farsibaff”, with one thick and one thin weft for each row of knots. It is strange to observe that the design of the carpets is inferior in judging the quality of the carpets, and the number of knots being the only parameter. In local nomenclature, these qualities are 30, 40, and 50 Radj, indicating 30-50 knots measured across the carpet within 6,4 cm. Recalculated to normal measures this means 220.000, 390.000 and 610.000 knots per square meter. The 6,4 cm is said to have it’s origin from a previously common measure, namely a cigarette! On the Kerman looms, the machine spun cotton warp is strung between the upper and lower beam, forming a vertical plane. 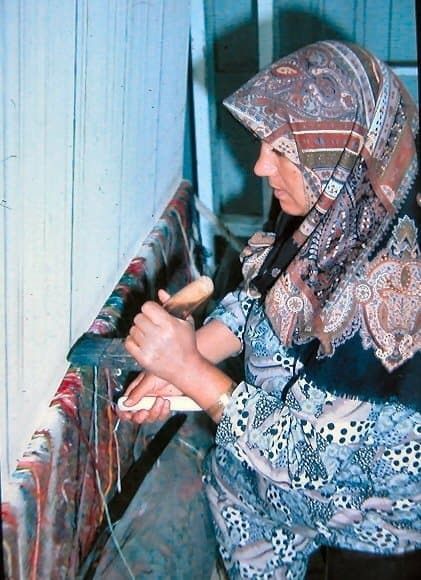 For the craftsmen to have a working-measure, they draw horizontal lines with markers directly on the warp. I noticed that the interval intended to be one day’s labour, was only a few centimetres. Even this seemed to me a long stretch for one person to manage in one day, but the “Ostad”, the leader of this shift, said that the knotters, all women, were working in intervals. Some working long days and some shorter. My companions were astonished by my brutal question on how the selling-prices were established, but the answer came without hesitation; The least expensive quality costs 65.000 Toman per square meter, without any finishing process done, straight from the loom. The front side of the carpet is then only coarsely cut and only the outlines of the design is visible. To have a more precise idea about the pattern, one has to look at the back, like we explained concerning the large carpet in Kerman. The materials, we were told, cost 15.000 Toman, the work itself 20.000 Toman and finally 7.000 for the materials and mounting of the warp and weft. All pr m sq. The difference, i.e. comes to about 23.000 Toman. That was indeed an essential information ! The prices of the mediocre and the supreme qualities were subsequently 105′ and 140.000 Toman. 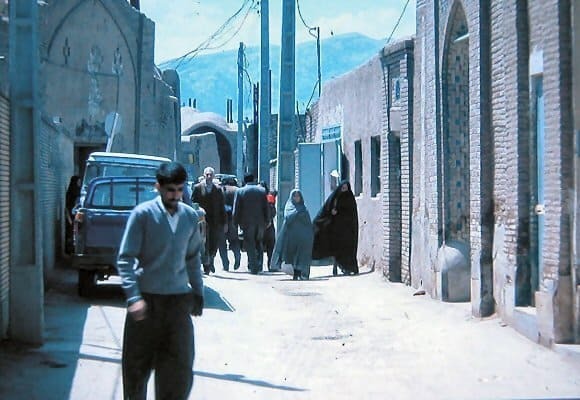 In the middle of Kerman, close to the Hadjis warehouse, we suddenly turned through an old wooden door into a narrow alley just so wide that I could touch the walls on each side with my hands. The walls were made of clay in a warm terracotta colour and reinforced with straw. Through this inconspicuous passage we entered Hadji’s old villa with a little pond and flowering orange trees, first recognized by the wonderful sweet smell that now had become so familiar to me. The place was now a carpet factory. The old Hadji told us that he now had made a contract with his old Ostad who rented the place and he himself had nothing to do with the daily work. All included, the business had almost one thousand persons in work ! 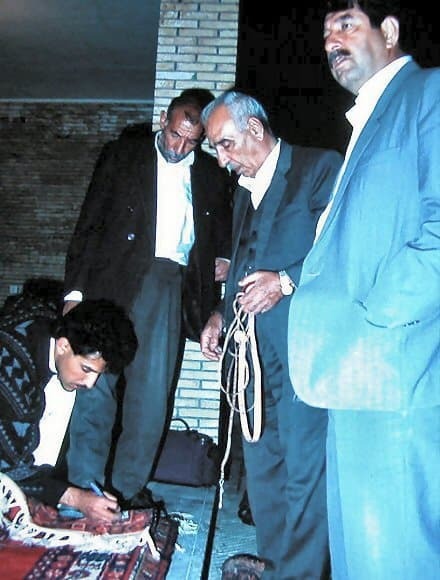 Sadegh took of course the opportunity to discuss production details with the Ostad and his former boss, concerning the use of vegetable dyes and hand spun wool for these carpets, as he had mentioned it for the Afshar brothers in Sirjan. Was I here witness to the start of a new carpet era where we again could hope to see Kerman carpets with shining natural coloured yarn? I have seen the old public baths of Kerman! Imagine the following: Hammam-e-Ebrahim Khan Zahir-o-dole, 270 years old still with some of it’s former splendour visible! And it is still a public bath, with beautiful walls and floors decorated with tiles, the ceilings with arched tileworks in perfect balance. In the centre of the first room, the wardrobe, a tiny pool with goldfish underlined the quietness even more. 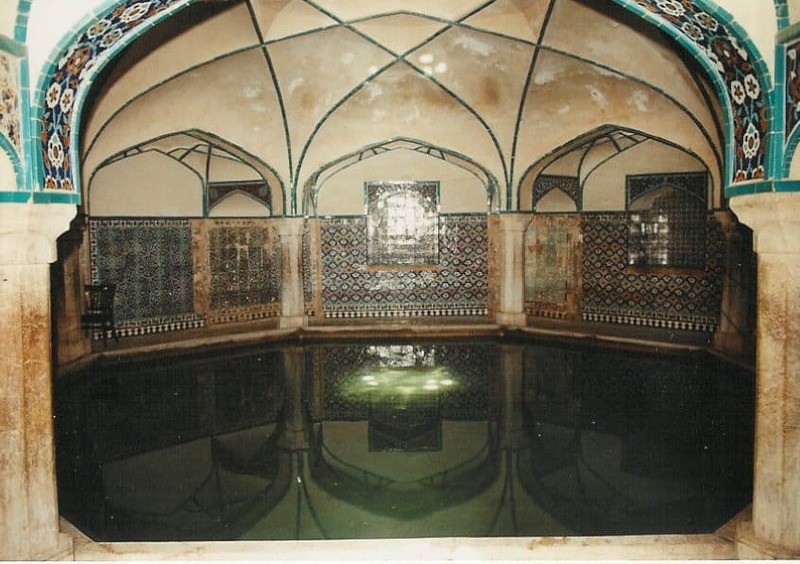 The oldest and finest bath; the Hammam-e-Gangali Khan is now a museum. This bath consists of numerous rooms and pools, where the guests could choose the one with the right temperature. The entrance to one of the pools was over a shining jade-green threshold of marble which had been polished for centuries but the sliding of buttocks, leaving it with a senseless patina ! 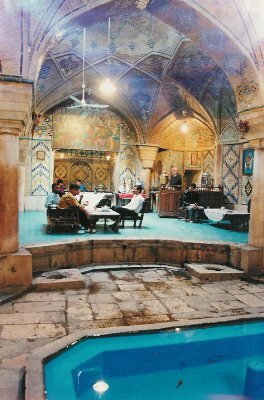 The last hammam was now a tschaikhaneh, a teahouse, in the outer rooms. Inside, by the old pools, there was now a restaurant. This is the 150m year old Hammam-e-Vakil-o-doleh. We were offered tea and water-pipe. This very strange pipe gives you nothing if you puff on it as if it was a regular pipe. You have to work it real hard, sucking deep down like a heavy smoker to produce some smoke at all. The result is mild, because the smoke is washed through the water of the pipe retort. The result is so neutral that the whole idea of smoking puzzles me. One might reinforce the tobacco with other substances? They say that smoking devices with reinforcements are so popular in Kerman, that when you fly over the city, it is always hidden in a large cloud! We were not very concerned about carpet business that day. We merely looked through what we had selected two days earlier. Only some of these were older. One carpet had a strange design that was unfamiliar to all of us. One had large Botehs, was thick and heavy and had a wonderful wool with beautiful shine. I was already eager to see the carpets at home, all washed and ready. Finally we were heading home for Teheran. When the plane finally took off, it tilted hard to one side, giving us a perfect view of the mountain, which now reminds me of the large white “Molar” of Montserrat protruding from the flat country south of Barcelona. For the first time, the air over Teheran is crystal clear when landing. The next day we were tourists, and as always, the trip was concluded with a wonderful and warm dinner party with the entire family . Note: This article is a extract of Lars Nygård’s original article.